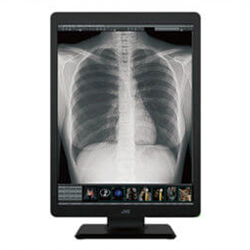 JVC CLS-300 (CLS300) is an optimal solution where doctors need to view both grayscale and color images, and effectively covers multiple applications like PACS, CAD, PET and nuclear medicine. The new i3 color series render more precise color and monochrome modality images. One of its unique technologies the built-in self-calibrating sensor ensures that the monitor constantly performs at its best. 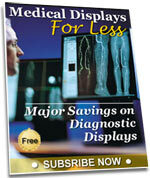 Brightness is automatically adjusted on patient lists and reporting applications to reduce eye strain. Calibration and QA standard tests with the scheduling functions through an intuitive and easy to navigate user interface make it effective to manage day-to-day operation in the radiology department. * QA Medivisor Agent LE confined the functions to is bundled with CL-S200/CL-S300. Calibration kit CAL-016 is required for QA standard test. With the integrated color front sensor, the CL-S200 / CL-S300 self-calibrates to the DICOM Part 14 Standard on a regular schedule. Utilizing its unique X, Y, Z, color level tracking and color management technologies, any of the i3 model perfectly color-matches one another even different location. The soft LED light indicator and front buttons are streamlined for intuitive operation. The new design of the CL-S200 / CL-S300 reduces 25% of the stand footprint compared to the conventional models. The back side features a stylish gray-white tone color. With the DisplayPort 1.2, the use of daisy chains allows for easier wiring connections.